Interviews - 2012 - December - Pop! Bang! Boom! 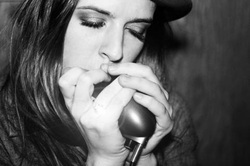 In case you haven’t noticed, I kind of have a crush on ZZ Ward. But, how can you not? She’s bluesy, hip-hoppy, indie, poppy, and all-around fantastic. And like, look at her. She’s got swagger.